In this retold tale, we learn of cooperation, symbiosis and friendship. It is a typical explanatory tale with lessons for life. There are vibrant illustrations in blue and greens, orange and browns–oil paint on denim—highlighted by borders of white. The story begins with fearsome Crocodile lying quiet and still on the bank of the St. John River in Liberia, West Africa where he resides. He is in pain because he has a sore tooth. The many forest animals wonder why the mighty crocodile is lying quietly on the riverbank and ask, “Why is Crocodile not moving?” Guinea Fowl, Leopard, Tiny Leaf Walker, Monkey and Snake observe that the river “is a very dull place these days” (6). After all the animal speculation, “old and wise Turtle” offers to go to Crocodile to find out why he is so unhappy (9). Turtle becomes the mediator/go-between in the tale but it is Plover Bird [who] has knowledge and skills and the cleverness to [solve Crocodile’s problem]. She gathers ingredients from the forest and wood ash from a village and [tells] Crocodile that she will use the medicine and clean his teeth if he will agree to give her the bits of fish from his teeth for her and her children and that he will never harm them, forever and ever. When Crocodile agrees, she hops in his mouth, applies the medicine to his sore tooth, and proceeds to clean his teeth for bits of fish for herself and her children. The last page summarizes that this is why in Liberia, “the fearsome crocodile allows the little plover bird to hop about in his mouth cleaning his many teeth” (32). The text and the illustrations are vivid, with enticing read aloud repetitions. Young readers will enjoy a clever story and learn about the varied fauna found in tropical West Africa and their symbiotic existence, as well as life lessons about cooperation and interdependence. There are several minor concerns. In several sections, the author inserts too much exposition. He includes an explanation, the moral of the story, in the voice of Turtle, “wise as he was” (30), but readers should be able to figure this out on their own. 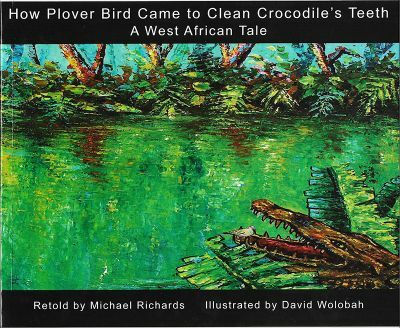 In an author’s note, Richards states that it is probable that the story of the crocodile and the plover bird “was originally brought to Liberia by Islamic groups in the thirteenth or fourteenth century AD.” It is not clear what the evidence is for this statement. There could be similar stories in many parts of the world and though wars and migrations from the medieval empires of the Sahel pushed migrations of peoples further south toward the coast, it is unlikely that Islamic groups were in Liberia in the 13th or 14th centuries. A minor but persistent annoyance is the gratuitous use of “native” when writing of African topics. The writer notes that the illustrator “specializes in depicting native life…” Why not: Liberian life… the illustrator, a Liberian…local life? There is an app, “Dentist Bird,” available for $1.99. Reviewed by Jo M. Sullivan, Ph.D., Independent Scholar.